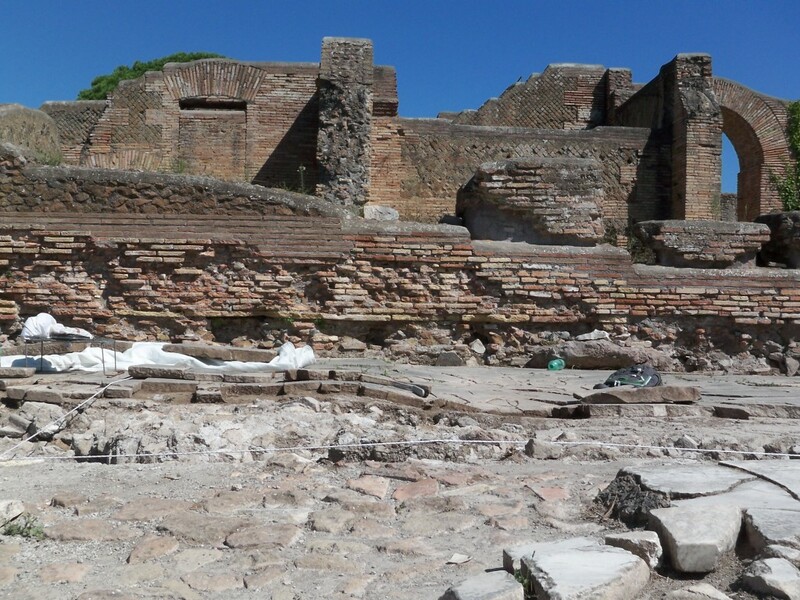 During the campaign in 2010 the biggest portico at Ostia’s Forum (, see section “MFP“) was cleaned for the first time since its excavation in 1924. 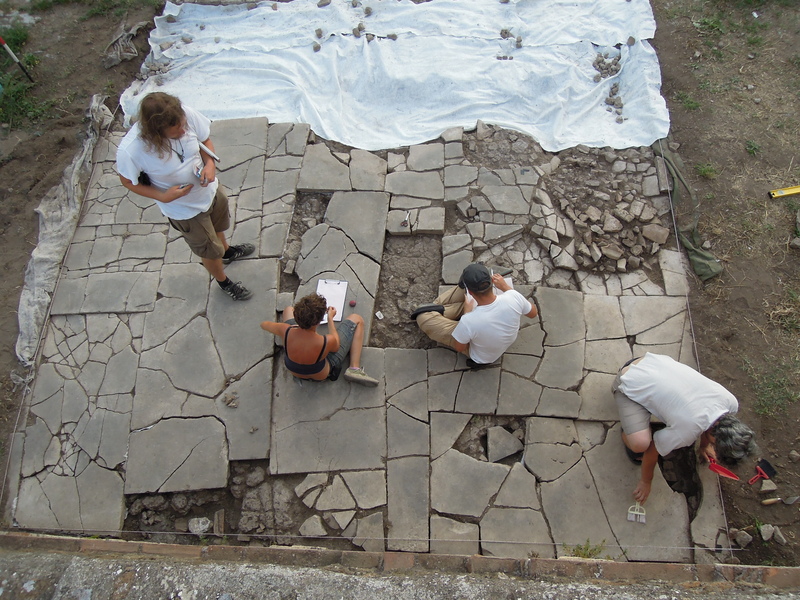 Some areas, like grid G (see pictures below), were preserved with a micro-stratigraphy above the pavement in situ. The pavement in its preserved condition has a very uneven surface (see picture below). This is due to the different qualities of fillings underneath the visible slabs. The geo-physics conducted in 2011 showed some cavities on one hand and solid walls of older constructions on the other in the depth of 40 cm until 2 metres underneath the present walking-level. Especially in areas of cavities, the pavement and its mortarbedding are sunken more than 20 cm. Cracks in the mortarbedding could have been a consequence of static problems, due to an extraordinary weight of objects on top of the slabs, or singular catastrophic events like floodings or earthquakes. In the area marked in red (see picture below), the pavement was locally very deeply sunken, due to a cavity in the underground of the slabs. However, the slabs in this position are almost 10 cm thick and show a concentric shape of cracks heading towards the middle of a “crater”. Therefore, a “crater” of that shape can only be explained by an approximately round and heavy object having fallen from a high position down on the slabs. The slabs underneath the filling are cracked, but completely preserved. 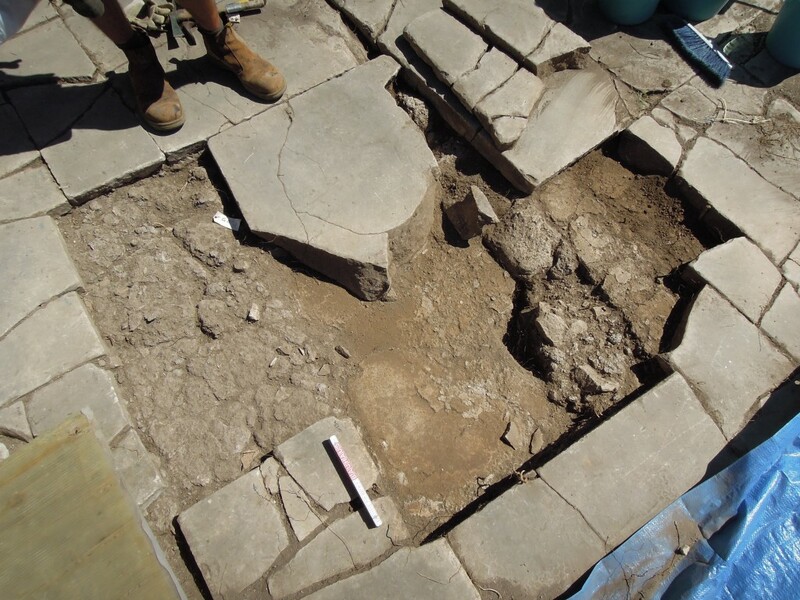 A specific filling of marble slab-fragments (which partly fit together), ceramic rooftiles of late types, ceramics and debris was used to fill up the sunken part of the pavement. Obviously the filling was a deliberate repair after a collapse with the aim to level out the surface again (see picture below). By a closer analysis of the “crater” and its fillings in 2013, we surprisingly found remains of mortar on top of this filling. 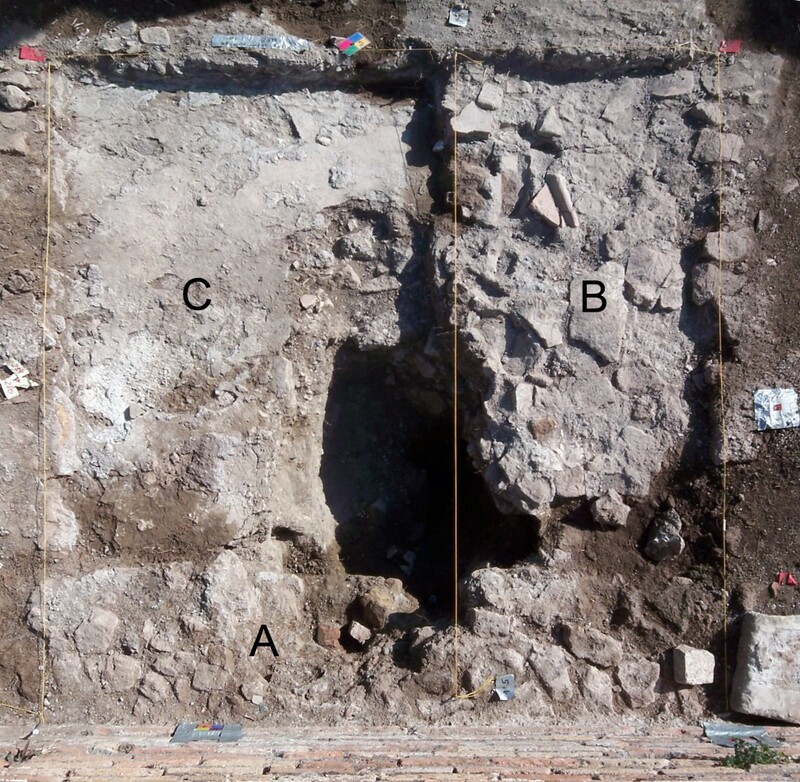 This indicates that it could not have been the material of the building’s final collapse or later periods being randomly preserved here, but rather demonstrates that the latest pavement seems to have consisted of mortar on top of the nowadays visible slabs. Supporting this theory, all slabs near the backwall, which were sunken deeper than the surrounding pavement, have irregular chisel-marks. These marks can only be explained as a preparation for a layer of mortar, which once was placed on top of the slabs. By a very close examination of the chisel-marks we even found minimal remains of that mortar (see picture below). These minimal remains have a major significance: the latest slabs of the pavement, which at least can be dated to the second half of the fifth century, were not the last status quo of the portico before its final collapse. There was one more building-phase and obviously a complete repair of the pavement, however, in a very improvised manner. Large architectural fragments with an extraordinary thickness of more than 20 cm (see picture below) originating from a collapsed entrance arch to the Forum, which was probably once situated at the Decumanus, were relaid in the pavement before the mortarbedding had been cracked, due to catastrophic events. Both the catastrophe and the last repair happened after the deliberate dismantling of the entrance arch. 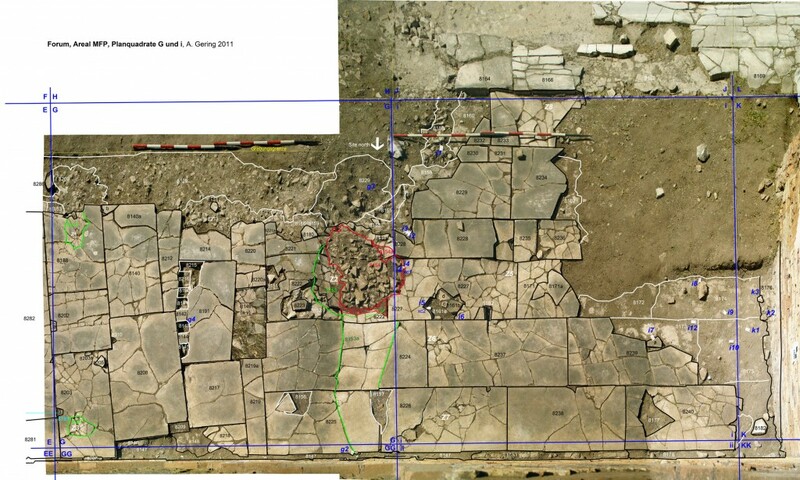 This corresponds to our hypothesis that we can not assume a very humble and improvised repair like the mortar-topping of the sunken slabs, and major building activities like the latest raise of the Forum-level at the same time. 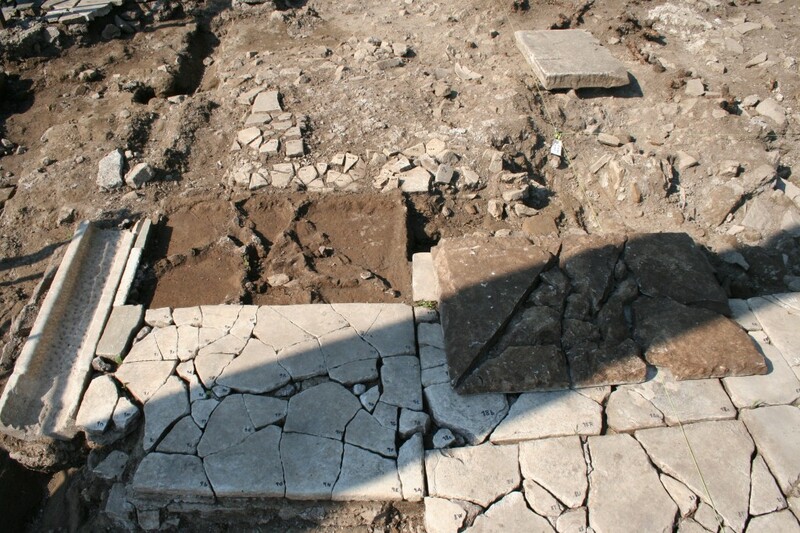 This level-raise partly covered temple-fragments of the Roma and Augustus temple (TRA), which could not have been reused easily for a monumental re-paving. After several late antique building-phases with a massive reuse of monumental architectural elements, we suppose that the building history of the Forum extends even into the 6th century, where we still could expect some kind of an Ostrogothic renewal or even repairs under the later Byzantine control, similar to some selected repair-activities at the Forum Romanum. Supported by coins and ceramic-dating, we can establish a relative chronology of several catastrophes and their repairs before the final collapse of MFP and the remaining Forum. Every generation of researchers seem to postpone the final end of Antiquity. By judging our stratigraphy, the final collapse of the Forum at least, can not be dated in the 5th century. It is certainly not the previously assumed end of the representative centre already in the times of Alarics sack of Rome AD 410. Neither is it the consequence of vandalic activities in the 450’s. “Post-barbarian” urbanism can be connected with building-activities even after the official end of the Western Roman Empire defined by the death of the last emporer, Romulus Augustulus, in AD 476. In the times after the so-called collapse of municipal power of the local administration and the old families, and the shift of this power to bishops, there were still profane buildings being repaired and almost newly erected, like the bridge from Portus to Isola Sacra, and not only the sacral buildings, which were the center of former late antique research. Our observations of the latest building history of the Forum fit into this overall picture and seem to postpone the end of Late Antiquity once more. The latest repairs recorded so far in the portico MFP seem to be mixed with evidence of early medieval and later robbing-activities. For a more coherent picture of the development of the 6th century Forum, we can have a look at the portico MFW. Beneath a broken mortarbedding, executed in a very improvised manner, we have found filling material, which contained terracotta roof tiles, coins, metal-objects and commercial-ceramics of the late 5th and early 6th centuries (see picture below). 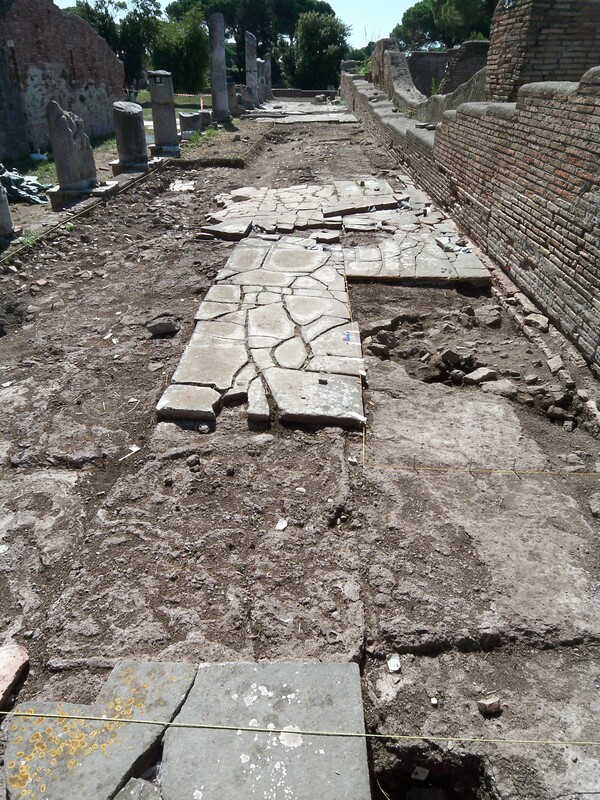 Even if we assume that this repair did not respect the uniformity of the second century pavement, we have to attest that a representative attitude was still maintained: in MFW, even the last pavement remained in marble as in the entire northern half of the Forum, where slabs were still preserved north and south of the Capitolium and of course in MFR. This is the opposite of the situation in the southern half of the Forum, where both poticoes, MFP and MFD, were obviously re-paved with a simple mortar-surface after a series of catastrophes. 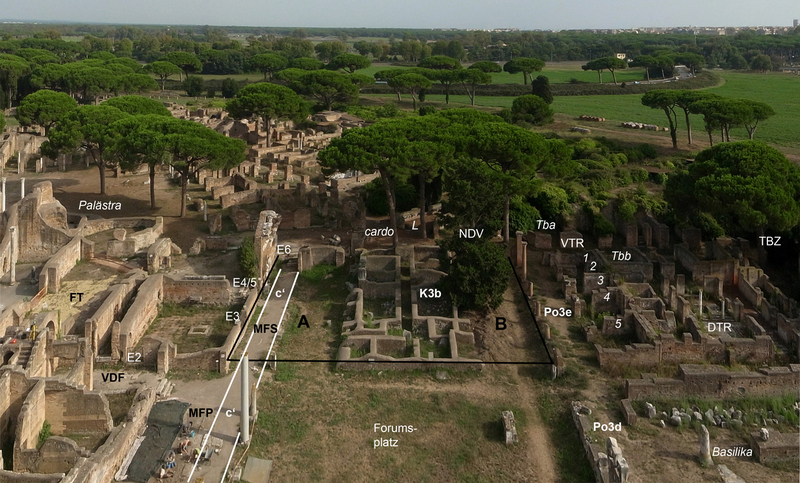 This leads to the hypothesis of a functional division of the Forum in its latest building-phases: while the part north of the Decumanus was obviously repaired until the end of Ostia’s occupation, the part south of the Decumanus seems to have suffered a fundamental change of function. In the northern part, the Capitolium was still renovated after major earthquakes. The surrounding porticoes served as a place, where statues of the imperial house and gods from abandoned temples were re-located (see section “Rewriting Late Antiquity part 2“). In the south part of the Forum however, the Roma and Augustus temple (TRA) had been intentionally dismantled to gain a broader acces to the Forum’s baths (TDF). If we assume that the latest walking-level corresponds to the latest entrance to TDF, approximately 1,2 m above the present walking-level, the areas A-B marked in black (see picture below), which correspond to the walking-level of the portico MFD, would have covered the ruins of the podium of the Roma and Augustus temple completely. 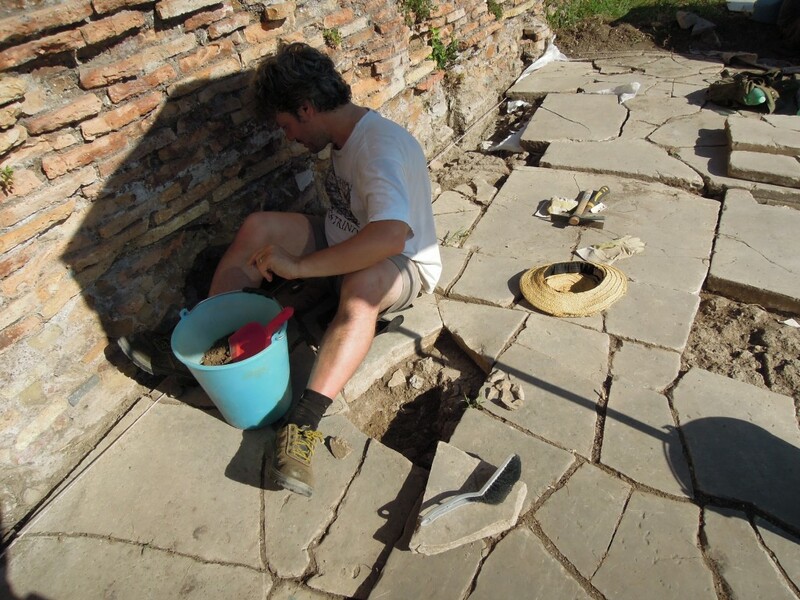 The porticoes surrounding the dismantled Roma and Augustus temple were either predominantly used for commercial purposes, which can be attested by many postholes in the slabs, or used as storage- and working-rooms for artisans, who recycled building-material for its reuse in the more prominent north parts of the Forum. In MFW, slabs were embedded in an already broken condition, but the gaps between the cracks were probably filled with fine mortar (see first picture below), so the fragmentation of the slabs became less visible – a phenomenon similar to the last phase of pavement found at FSE (see second picture below). Some of the very late repairs clearly resemble drastic static problems, which can only be attested as a consequence of earthquakes. The status quo of the latest pavement-levels, which were found in situ, was product of several catastrophes and the constant struggle to overcome these (see pictures below). 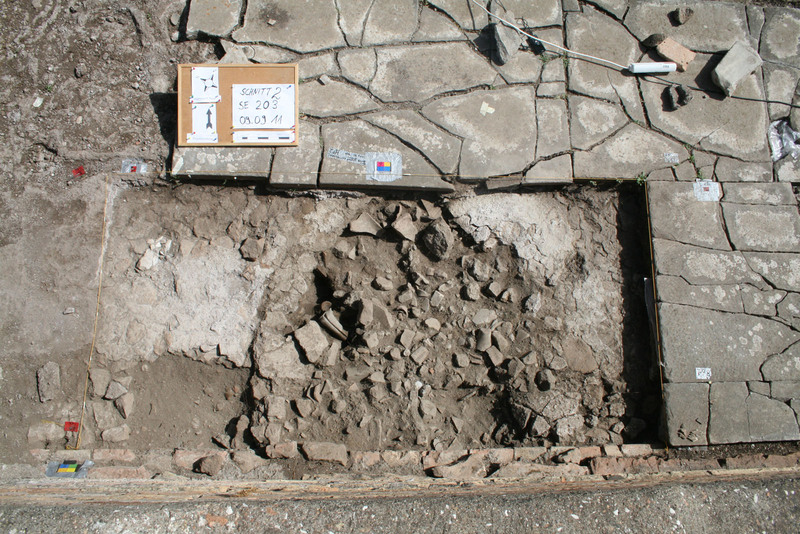 Construction-pits disturb the regular mortar-stratigraphy in MFW (see picture above). Their fillings still have to be analysed to gain a fixed chronology of the post-5th century building activities. In this regard, especially the west portico MFW and the south west portico MFD can broaden our horizon (see section “Rewriting Late Antiquity part 2“). 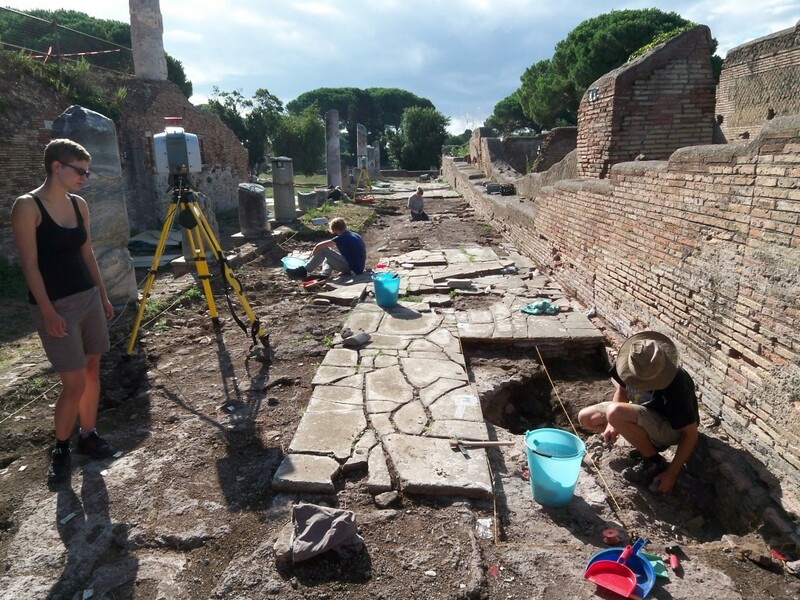 Here we have evidence of the latest mortar-floors on top of the already collapsed pavement and due to concentrated coin-finds in the south west parts of the Forum, a coin-dated chronology of the final end of Ostia’s monumental urbanism can be established. The superficial stratigraphy of fillings underneath the latest slabs of MFP (see picture above) and MFW (see picture below) show a series of several different repairs on the same level, which was maintained even during the 6th century. By defining the differences of the mortar-qualities, we were able to establish a horizontal zoning of the latest repairs instead of a vertical stratigraphy. Surprises are still possible, not necessarily by excavating, but by analysing the finds in all fillings examined so far. 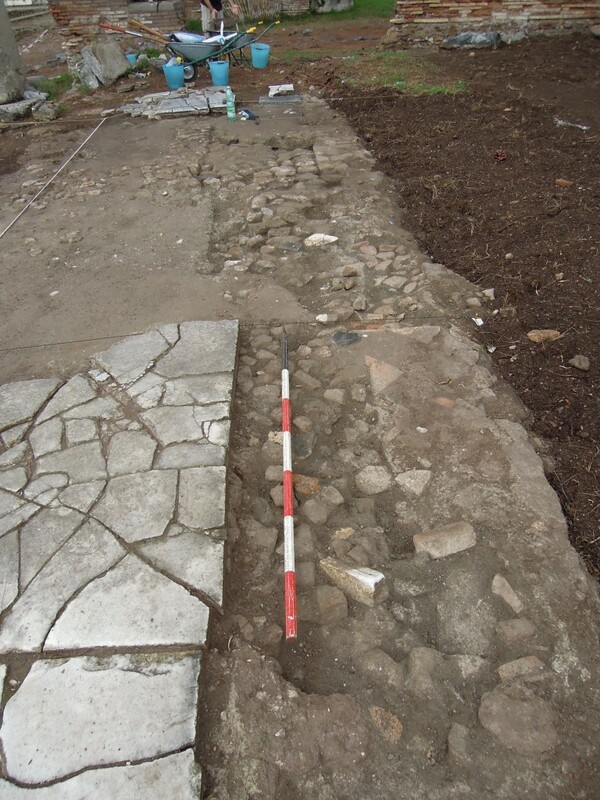 Areas of previously assumed 2nd century pavements (see picture above) appear as the latest repairs known so far in the 6th century, maybe even with a terminus post quem of a coin of Phokas (?) in the early 7th century or later.